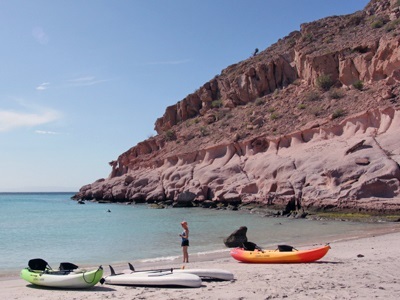 ?Kayaks and standup paddleboards ?are at the ready on Ensenada Beach at Isla Partida. ABOARD THE SAFARI ENDEAVOUR—The plan for today was to anchor off Los Islotes (tiny islands off the tip of Isla Partida) and spend the morning with the California sea lion colony living there. The crew had told us the dark brown males can weigh up to 600 pounds, and do a lot of posturing–baring their teeth and looking threatening. The lighter-colored females, weighing about 200 pounds, feed at night and would be sleeping when we approached the rock outcroppings where they hang out. But the young pups born last summer are always ready to entertain visitors. We would have a choice of observing them from skiffs and kayaks or donning our wetsuits to snorkel with the playful pups. 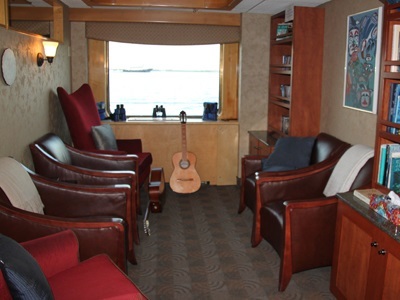 The Endeavour library contains valuable resources on the Sea of Cortez as well as being a quiet place to read. However, as the ship approached Los Islotes, the sea was crashing over the reefs and causing the Endeavour to rock and roll more than any other time since we’d set sail. We’d snorkeled with sea lions in the Galapagos, so we were disappointed, but as always, Captain Barrett had a Plan B. While we sat down to a breakfast of maple baked French toast, omelets or gorditas, he steered away from the rough seas in the bay to the western side of Isla Partida, and anchored in Ensenada Grande, a protected cove with a great beach. Some sources say this is one of the prettiest beaches in Mexico, and I can’t argue with that. The red rock cliffs around it have been undercut by the sea, carving them into wild shapes, and dropping huge boulders into the water. We explored the coastline by skiff, marveling at the geological makeup of the island, and the way the desert seems to hang over the water, ready to topple, cacti and all. Once again, the visibility was superb, so we grabbed our snorkel gear and set off from the shore for a closer look, as frigate birds and brown pelicans fished from the cliffs. Standup paddle-boarding provided another way to explore the rock face from the water, and some of our shipmates took a boulder climb to a spectacular overlook. 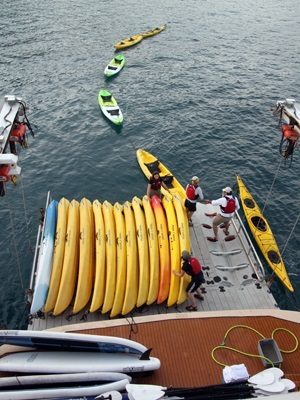 The crew unloads kayaks from the swim step on the stern of the ship. Played out, we collapsed onto deck chairs the crew had brought ashore, and enjoyed a lovely coconut drink laced with rum. All the ingredients for a beach party were there—tubs of ice cold beer and soft drinks, a cooler full of the latest concoction from the ever-inventive bartender, and snacks. Isla Partida is connected to Isla Espíritu Santo by a narrow strip of land. Both islands are UNESCO biospheres, and it was refreshing to see that boaters who visit this little slice of paradise take their trash with them so the beaches remain pristine. Back on board, we watched another spectacular sunset from the deck off the lounge, having drinks with our new friends. There are many great viewing areas on the Endeavour, including this one, which has the advantage of being close to the bar and the evening hors d’oeuvres. At dinner I finally decided to forego the fish (red snapper with citrus butter) and have duck breast with rosemary jus, polenta and green beans. Good choice. The quinoa salad looked tasty, too.